English parish churches constitute a living patrimony without European parallel. Their cultural riches are astonishing, not only for their quality and quantity, but also their diversity and interest. Fine art and architecture combine unpredictably with the functional, the curious, and the naïve, from prehistory to the present day. Because church treasures usually remain in the buildings they were created for, when properly interpreted they tell from thousands of local perspectives the history of the nation, its people, and their changing religious observance. 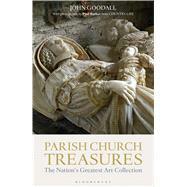 John Goodall's weekly series in Country Life has celebrated particular objects in or around churches that are of outstanding artistic, social, or historical importance, to underline both the intrinsic interest of parish churches and the insights that they and their contents offer into English history of every period. Parish Church Treasures incorporates and significantly expands this material to tell afresh the remarkable history of the parish church. It celebrates the special character of churches as places to visit while providing an authoritative and up-to-date history at a time when the use and upkeep of these buildings and the care of their contents is highly contentious. Dr John Goodall is an award-winning author and Architectural Editor of Country Life, responsible for the celebrated articles on country houses that feature in the magazine each week. Previously a researcher and historian at English Heritage (where he was involved in the re-launch of their guidebook series and worked on several flagship exhibitions), he has been involved in various television series on history and architecture, including BBC1's The Way We Built Britain (2007), presented by David Dimbleby. Paul Barker is one of the UK's leading architectural photographers and has illustrated many books including Simon Jenkins' England's Thousand Best Churches (1999) and the publication accompanying David Dimbleby's BBC1 architectural series How We Built Britain (2007). Recently he has been the author and photographer of three books which celebrate the architectural merits of three great cities: Liverpool, Dublin and Leeds.